Will the Google Autonomous Vehicle Drive Like the Segway? Google Inc., Caltech and other organizations have been working to develop such vehicles, which use radar, video cameras and lasers to navigate roads and stay safe in traffic without human assistance. Google has said that computer-controlled cars should eventually drive more safely than humans, who, after all, get sleepy and distracted and can’t see in every direction at once. This was at the back of my mind when I listened to the webcast of Andy Bechtolscheim’s lecture on innovation (full YouTube video) at Stanford. During Q&A, I submitted a question via the web asking for Andy’s thoughts on self-driving cars as an innovation. He laughed it off saying he would not want to be in one. I was hoping for a more erudite response, but then I thought, the off-the-cuff reaction said a lot more. Here was an innovator, entrepreneur, investor, the kind of person that is likely to get excited about path-breaking innovations saying that he wouldn’t want to be in a self-driving car. So when I ask if Google’s autonomous vehicle will drive like the Segway, I obviously don’t mean in terms of automotive and transportation capabilities. We all know where the Segway went, er, not too far. It got relegated to niche scenarios – cops in malls and airports, in theme parks, and Woz playing Segway Polo! Will the Google Autonomous Vehicle (GAV) go further or will it be relegated to it’s own niche scenarios like, oh say, self-driving golf carts, or self-driving tour vans in an African safari, essentially anyplace where the route is well known, starts and stops can be well defined and other traffic or pedestrian interference is likely to be minimal? I love the technology behind such innovations as the Segway and the GAV. However, radical ideas, especially those that promise to disrupt at massive scale, not only need lot of support to become mainstream but also need to overcome opposition from unexpected quarters. Henry Ford’s automobile was going to need new roads, gas stations. The regulatory and legislative environment needed to evolve to define good driver behavior when people figured they just couldn’t drive the automobile in all directions and at any speeds. With the car, for the first time, people could drive farther, so the invention was a must-have and had to be supported. The Segway, on the other hand, faced staunch opposition from organizations like America Walks and the American Council for the Blind, who opposed the use of the device on America’s sidewalks. As a result, more than 30 states have sidewalk restrictions on the Segway. 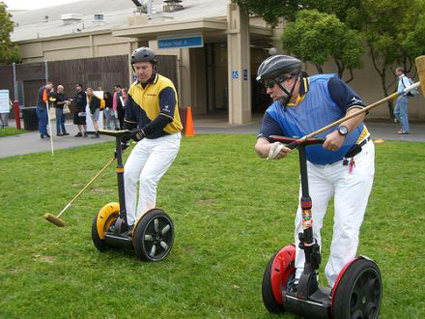 Moreover, there was this growing perception that anyone who used a Segway was likely just too lazy to walk. The invention could not change people’s behavior and became nice-to-have. People preferred to just walk, and also not getting hurt either on one or by one. GAV is likely to face similar challenges. Is it a must-have or a nice-to-have? The whole point of a car, which gives most people a lot of pleasure, is the driving. Now there are people who grudgingly drive their cars out of no choice, but the feeling of controlling a huge machine is undeniable. There are other questions. How will the insurance industry look at GAV? How would fault be assessed in case of an accident? How much liability does the manufacturer assume? These are tricky questions and could cause delays in when the invention becomes widely available. This will likely need to be more of a public policy innovation in addition to a technology innovation. Otherwise we are looking at niche scenarios like the ones mentioned earlier. Horses could not co-exist with Henry Ford’s automobile, the car won that battle. Pedestrians could not co-exist with the Segway, the Segway lost that battle. In this case, regular cars can share the same roads as the GAV, so its not so much a question of either-or. Over time the technology and public policy will both evolve to alter consumer preferences and behavior, so longer term I believe the future is bright for autonomous vehicles. I have created a poll on Wayin to understand how the concept of an autonomous vehicle appeals to people. I would love to get your vote. While we are at it to reduce human error and keep our roads safe, how about autonomous commercial aircraft to reduce pilot error especially when pilots fall asleep or get distracted in the cockpit!! And it’s not that much of a stretch considering we already have unmanned military and space aircraft. Rahul, Nice article. Are you trying to predict or judge the success of “autonomous vehicle” idea? It is a dangerous game. And many people including Sir Isaac Newton have lost their money playing this game. The best thing one can do, IMHO, is to perform low-cost experiments and let the idea unfold. What is ‘low-cost’ may depend upon how much money one has on reserve. For a company like Google, even if the idea doesn’t go very far, it is not going to create a big hole in its pocket. For an individual entrepreneur, like Henry Ford, it makes a difference. Incidentally, the future of what Ford was working on (gasoline based car) was far from certain. You can see the scenario from Ford’s point of view in 1898 when he had demonstrated his working prototype here. You mentioned that Prof. Andy laughed at the idea. That’s usually a good sign. I like Einstein’s quote “If at first, the idea is not crazy, then there is no hope for it.” Many in the audience laughed when someone asked Prof. Jagdish Seth to comment on Space tourism idea in 2005 when he visited Sasken. He said, “I wouldn’t laugh. Richard Branson has entered the game. He is not a fool.”. In fact, Branson narrates the history of experimentation associated with Space tourism since mid-90s in his book “Business stripped bare”. I wrote about it here. Incidentally, a lot of initial research on space tourism was sponsored by Paul Allen, Microsoft co-founder – equivalent of Larry Page of his era. How does one evaluate ideas in spite of our inherent “prediction disability”? Here is what I learnt from the Black Swan wisdom. Vinay, thanks for the comment and also the various links. Very informative. I am not trying to predict or judge the success of the autonomous vehicle idea, simply because I am not in a position to do so. I am trying to understand how to evaluate this idea. The framework in the Black Swan seems to be a good framework – the matrix of cost of experimentation and likelihood of success. But the likelihood of success is again an assumption. I also tried to look at earlier innovations in transportation and what kind of societal change they entailed, like Ford’s automobile and Kamen’s Segway. One was a spectacular success while the other was not quite. So I was trying to look at the autonomous vehicle through this filter, and understand what it will be up against. I would love to know how Ford thought about the impact of his invention on society or was he purely focused only on experimentation. Thanks for the very insightful comments. The framework for evaluation is not from the The Black Swan book. It is something I wrote based on the ideas in the book. So it’s usefulness or robustness is not time-tested yet. Also its second axis is not “likelihood of success”. It is the maximum impact if the idea is successful. Far example, in the case of “autonomous vehicle” idea, we need to ask the question, “How much of an impact will this idea make if this trend picks up BIG time?” The answer would be “A lot”. Ford was an experimenter at heart when he started working on his idea. There were many people experimenting on “horseless carriages” at that time. He was one of them. He had two failed start-up experiences after he quit Edison’s company before he started Ford Motor company. I don’t think he could have imagined the impact the idea might make. I could be wrong here. I feel it is only rare that the idea author can visualize the full impact of his idea. Bill Gates is one such person who understood the impact of Moore’s Law which Paul Allen told him when Gates was in 6th or 7th grade. When Mark Markulla funded Apple (first angel funding) Steve Jobs and Steve Wozniak thought of making computers to play video games. Markulla, an ex-Intel guy, told them ladies would be writing recipes and offices will use them for accounting. The two Steves found it hard to believe. Of course, it is fun to analyse. Why think of the autonomous vehicle idea as “either-or”. Why can’t the research lead to a hybrid car – partly autonomous? Also I wonder if the outcome of the research could help prevent the Hampi Express accident that occurred in Ananthpur district a few days ago? One way to look at this kind of project as an innovation platform, generating multiple types of innovations. Vinay, thanks. I will get hold of the Black Swan book, looks like an interesting book to read. Thanks for all your insightful comments. Then there is the issue of public safety as well. Society found ways to make Ford’s automobile safe, but that did not happen for the Segway. Can we take that as some indicator of the necessity of the invention itself? How will the autonomous vehicle fair? Your point about cost of experimentation is very valid. I am sure Google and the other organizations are in this for the long haul and they probably can experiment for a long period of time. Have you come across any correlation between the length of experimentation and the success of the innovation? It would seem obvious that the longer you stay at something, the likelier you are to succeed at it. But over time the cost balloons. At some point you have to “launch” and let things evolve post launch, rather than wait until all stars align. Is that what Ford did? Is safety an important parameter of mass market transportation related idea? I would think so. Most breakthroughs have had a long sequence of experimentation by multiple people, organizations, academia etc. Even mouse took 30 years to reach mass market. Does it mean if an organization funds experimentation long enough, it will yield a good innovation? No. I like the framework Randy Komisar proposes in “Getting to Plan B”. He asks the question, “Which is the leap-of-faith assumption in your idea?” and then asks, “How soon can you test your leap-of-faith assumption?” A leap-of-faith assumption is something that is based on gut and crucial for success of the idea. A G Lafley calls this approach “Doing the last experiment first” in his book “Game-changer”. Good points. Proving or disproving the leap-of-faith hypothesis quickly is probably best to ensure that the cost of experimentation is low allowing for rapid revisions. In case of space tourism endeavor of X Prize, the challenge was simple: carry 3 people 100 km above the surface of the earth and do it twice in two weeks. This is a measurable goal. It would be interesting to know of what the intermediate milestone goals are for the autonomous vehicle idea. This is fascinating on so many levels. How about “Borivli to Churchgate and back during peak hours” as a challenge? Perhaps not “safe enough” as a challenge? YouTube video of a man who has lost 95% of his vision, being able to go about his tasks in a Google autonomous vehicle. Great video. Enjoyed watching. Thanks.